They are gaining in popularity as a luxurious addition to the bathroom. The garden tub has more room and depth than the typical bathtub and therefore offers more comfort when taking a long bath. Not all garden tubs are created equal, however. A wide variety of these luxury bathroom amenities have become available as the trend continues to gain traction among homebuyers and DIY remodelers. They are wider, deeper, longer and generally more attractive than regular bathtubs. A garden tub isn't only bigger, it is also bathed in beauty, from thick porcelain pedestal tubs to triangular-shaped tubs with waterfall features. 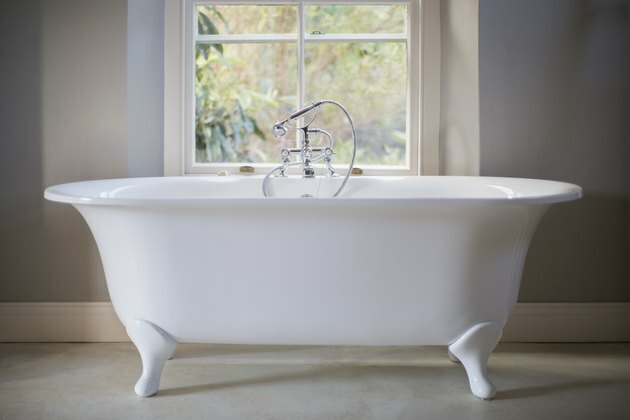 The term stems from tubs created in 18th-century Europe, when wealthy bathers preferred to lounge in warm bathwater in large tubs nestled in the rolling manicured grounds. The wide tubs found their way indoors in wealthy homes by the 19th century, and their popularity has continued to gain steam. Generally speaking, a basic garden tub is 24 inches deep and 60 inches long with a width of 42 inches. They can reach up to 70 inches long or more and have a depth of about 40 inches. The standard tub size is usually not more than 30 inches across and around 50 to 60 inches long. 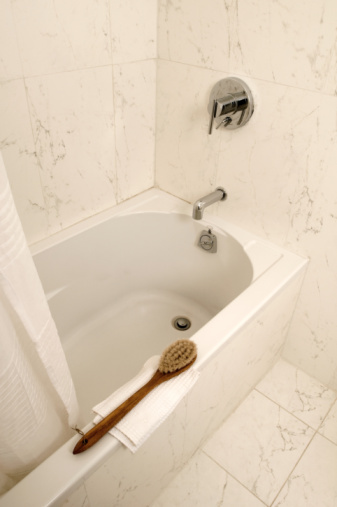 The standard tub depth is generally 14 to 20 inches. Because the garden tub can be free-standing, manufacturers have taken liberties with the design. They broke out of the standard tub size and shape to create curves, steps and waves to make the garden tub truly stand out in a bathroom. A well-designed garden tub raises the aesthetic of the room as well as the comfort of the bathers. Depending on your preference and style concerns, garden tubs come in a wide variety of materials. Generally, garden tubs are molded in enameled cast iron. This is preferred for its heat retention, clean look and ease of washing. A less expensive but still stylish choice is the acrylic garden tub. The acrylic material allows for dips and swirls in the design of the garden tub. While it will have a more unique look compared to a cast-iron model, acrylic can scratch and is harder to keep clean over time. It also doesn't hold heat as long or as well as cast iron. A garden tub allows the bather to truly get in a good soak. There is no need to worry about knees sticking up above the bubble line or feet reaching out over the edge. Being fully immersed in a pool of herbal-infused water can relieve minor muscle aches, treat common skin ailments and provide relief for sinus issues. The size and depth of a garden tub can make it more challenging to install than a standard tub. Make sure you have plenty of space around the luxury amenity to safely get in and out of the deeper garden tub. Many garden tubs come with a Jacuzzi feature with jets. These require a pump unit that may or may not fit in the garden tub depending on its design. If you have a sleek garden tub, a pump unit may need to be placed within 5 feet from the tub in order for it to work properly. It can be hidden in a closet or cabinet. There are many manufacturers and distributors of garden tubs. Home Depot tubs are available in a variety of sizes, shapes and materials and can be shipped to your door. There are two reasons to stick with buying a garden tub built for a mobile home: size and plumbing. A mobile home's plumbing is different than a brick-and-mortar home's plumbing. The bathtub size in a mobile home is usually 54 inches by 27 inches. Bathtubs bought at home improvement stores are typically 60 inches by 32 inches. Look for bathtubs that are specifically built for motor homes to save time and trouble with fitting and installing.